Pat Hickey was advised to put Shane Ross "back in his box"
Minister Ross said last week that he was “not happy” about what had transpired and wanted answers. OLYMPIC COUNCIL OF Ireland (OCI) chief Pat Hickey was advised by a colleague in recent days to put Sports Minister Shane Ross “back in his box”, it’s emerged. 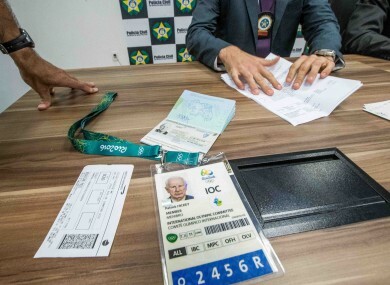 An email released by police in Rio de Janeiro in the wake of Hickey’s arrest today shows the Irish Olympic boss received advice telling him that Ross should be notified that the OCI was entitled to run its own investigation into how hundreds of the sporting body’s tickets were seized by Brazilian police. Hickey faces three charges in Rio, having been arrested at a hotel this morning. If charged and convicted of the allegations, the maximum sentence for the offences is seven years in prison. Ross flew to Brazil on Sunday and met with Hickey to discuss the matter after Irishman Kevin Mallon was arrested in Rio for allegedly touting tickets for Olympic events at exorbitant prices. The minister said last week that was “not happy” about what had transpired and wanted answers. Ross had wanted the matter investigated by independent observers as well as members of the OCI. The organisation, however, had resisted that idea. A meeting between the two didn’t go well, with Ross keeping tight-lipped on what was said. The email, from an OCI legal advisor, was released to the media in Rio earlier today. An outside legal counsel had been consulted on the matter before the email was sent, the advisor wrote. In general, Shane Ross needs “to be put back in his box”. You should say that at the moment an Irishman has been charged by the Brazilian authorities and is fundamentally entitled to due process and to the presumption of innocence. Hickey is further told to underline that the OCI is an autonomous body and entitled to conduct its own investigation “and will do so free from any outside interference”. Hickey is told to stress that the OCI investigation is examining the circumstances that saw a company called Pro10 appointed the OCI’s authorised ticket reseller (ATR) in Rio to hundreds of their tickets ending up with Mallon when he was arrested. Ross said this evening in a statement that he is returning to Dublin in order to deal with the fallout from the arrest. Attempts have been made to contact the legal counsel quoted. Email “Pat Hickey was advised to put Shane Ross "back in his box"”. Feedback on “Pat Hickey was advised to put Shane Ross "back in his box"”.